The dining restaurant 'Cafe de Chef' at Sofitel Ambassador Seoul features the supreme quality Korean beef, 'True Korean Beef' from May 10 to 26, 2007. 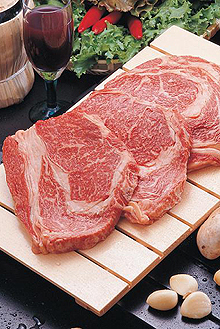 'Korean True Beef' is a brand of true premium Korean beef bred in the natural field. This premium breed can only be supplied by Korean farms that use castrated male calves and breed them under their unique process using certified feeds for over 30 months. It's always refrigerated for the freshest taste and processed under HACCP-certified system for the maximum hygiene. The special True Beef dishes at Cafe de Chef include 5 choices of a la carte featuring different types of sauces and also a 3-course set menu with True Beef main dish is available for steak lovers. Also, a famous wine from New Zealand, Peregrine Pinot Noir is available on sale at a special price to add deeper taste into your True Beef steak. Book your table through www.ambatel.com/sofitel and receive a 5% discount and additional 5% discount is offered for guests who visited during the period of the previous promotion 'Lobster Festival' from Mar 19 to April 22. Stay worry-free with this genuine breed of premium quality beef and your well-being dining is now all complete with our special True Beef delicacy. * Above prices are subject to 10% tax. 2) Online Reservation: 5% off on food and beverage. 3) Additional 5% off for guests who reserved ‘Lobster Festival (March 19~April 22)' through online. * Above offers cannot be combined.